Colorado DOT can plow a wider I-70 freeway through north Denver, after a decision Tuesday by U.S. District Court Judge William Martinez to deny a request for an injunction. The lawsuit filed by Elyria Swansea neighborhood groups and the Sierra Club against CDOT and the Federal Highway Administration is still pending, but Martinez’s decision means the federal funding spigot can begin to flow and CDOT can get shovels in the ground. The Sierra Club had filed the motion for a stay in November, seeking to prevent CDOT from starting work on a sunken highway trench that will nearly triple the current I-70 footprint in north Denver. Advocates want CDOT to conduct a more rigorous air quality analysis, which independent researchers have said will reveal adverse health impacts of the highway project that CDOT failed to take into account in its environmental review. “The Court has difficulty anticipating… it will conclude they acted arbitrarily and capriciously” when relying on emissions standards set by the Environmental Protection Agency, Martinez wrote in his decision [PDF]. The crux of Yuhnke’s argument is that CDOT failed to conduct due diligence, and that research by independent experts shows that a wider freeway would put Denver out of compliance with national air quality standards. Martinez has not yet decided if he’ll admit those analyses as evidence in the case. Yuhnke said he’ll be refining the arguments presented to Martinez as the case proceeds in court. I can’t wait to see those disgusting, polluting viaducts coming down. For whatever reasons Phoenix is decades ahead of Denver with respect to transportation infrastructure. Freeways that are appealing (lots of landscape and art), clean and safe. Maybe it’s the state’s proximity to California that’s led to highly engineered and pleasant (often below grade) infrastructure. Their one light rail line has the same ridership as the Top Three FasTracks lines ie the A Line, the popular Aurora H Line and the W Line. You can have both good transit and good freeways, at least in Phoenix. If you want to make Denver like Phoenix, then you are going to have to start knocking down a lot of neighborhoods and import a bunch of old rich people who have no expectations from their city other not asking for any taxes. Sorry, your comment went well over my head. Wait… are you referring to Sun City which appeals to retirees? Eh, it’s a smallish part and most aren’t rich – depending on your definition of rich I suppose. Total population is irrelevant to the quality and effectiveness of each metro’s transportation system. 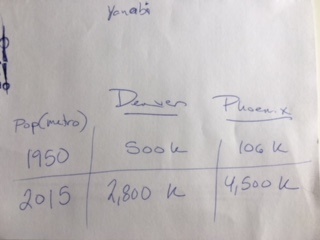 Btw, I’m sure some quick digging would also show that Denver’s per capita earnings are much higher than for Phoenix; Phoenix definitely has a lower socioeconomic profile when compared to Denver. The two city/metro areas are very different from each other but there’s only one difference that interests me. One has a good transportation system while the other doesn’t. There’s no relationship between the quality and effectiveness of transportation and population growth that I’m aware of. In fact typically the areas that have more growth have worse transportation as infrastructure investments lags growth. But since you’re obsessed with population growth I did find this interesting data: http://demographia.com/db-uza2000.htm Much as I remembered both metros grew in the 1970’s but Phoenix grew much faster and passed Denver’s population for the 1st time. If you’re not familiar with Denver, they had their ‘great recession’ in the 2nd half of the 1980’s which spilled over into the 90’s. It was that time period when Phx rapidly outgrew Denver. Gave you an upvote. The issue with Denver is more tied to the state not managing its transportation funds very well. Just drive up and down I-15 in Salt Lake City then up and down I-25 in Denver. SLC would win that argument hands down despite not even having half of Denver’s population. Small correction. The problem in Colorado is not having the funding; it’s hard to manage funding you don’t have. 🙂 Interestingly, our Governor has contrasted CO’s mess to Utah’s achievement using I-15 as an example. I think TakeFive misses the point on this. The community wants the current viaduct torn down and does not want the interstate rebuilt through their community. It is time that we remove these health hazards and community dividers from our urban centers. The interstate system was bastardized so that it could remove and divide minority neighborhoods, usually deemed “slums”, from our cities. Widening and “beautifying” interstates does not remove these environmental hazards. Cities across the country, like Tampa, FL where I live. Are dealing with similar projects that will widen the interstates and further divide and pollute our neighborhoods. This decision will have a ripple effect throughout the country. This decision is a travesty and I hope that CDOT and FHWA come to their senses and actually listen to the community instead of paving it over. Welcome to the commenting side; I’m honored to be the first. You should fit right in at Streetsblog.